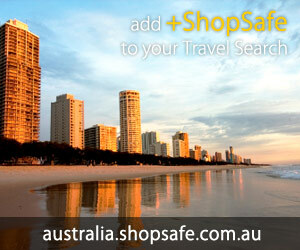 ShopSafe™ Australia - Safe Online Shopping. Want to Shop Online in Australia? ShopSafe™ AU was online #1st for online shopping in Australia, and has been continuously online since 1999; nobody else can make that claim. We've checked the security, delivery, range of goods and prices of the online shops and have 1948 shops listed in 146 categories, as well as special offers, bargains and gift ideas. We've reviewed the Australian online shops and awarded them a star rating that's completely independent. Even if a shopping site advertises with us we won't change their rating. So if you want to shop online, shop smart and shop safe - you can trust us to send you to the best online shops with trusted online shopping pages. We're your online shopping guide for Australia. We've got everything from toy shops and gift shops for your Christmas shopping to supermarkets for your weekly shop. Compare prices at our many book shops or CD shops, or send some flowers or chocolates for Valentines Day! Click on the shopping categories on the left to find the online store you're looking for. If you have any problems with our site or with any of the shops listed please let us know - email contact@shopsafe.com.au. We cannot promise anything but we will do the best we can to achieve a satisfactory resolution for you. For the best Australian online shopping sites, online shops and portal shopping, add shopsafe.com.au to your favourites now. Safe online shopping starts here. You can get some good advice from your Office of Fair Trading. We all appreciate the convenience of online shopping, no crowded shopping malls, full car parks or lousy weather to put you off your shopping stride but the big question always is, "will our gifts arrive on time"? All of the stores listed on a ShopSafe website have varied Delivery timetables for City and Country areas which you should always check before making a purchase. For the busiest times of the year - Christmas, Valentines Day, Easter, Mother's Day and Father's Day, online retailers will be doing everything they can to get your last minute business and will have posted holiday deadlines with cut off purchase dates to ensure delivery. Express Delivery is becoming a popular option for online retailers, as are Gift Vouchers and Gift Certificates that can be sent via email. A few online Department stores are now offering Pick-up points for larger items in major cities. Please try our search feature for more than 300,000 products that can be delivered to your recipient Australia wide. Capital City Deliveries: Same day and overnight delivery is usually available in Sydney, Melbourne, Perth, Brisbane, Adelaide, Hobart and Canberra. Deliveries of hampers need extra time although most merchants still offer overnight hamper delivery to most capital cities. Once again check Delivery timetables before purchasing and to avoid disapointment buy early to make sure the items you want are in stock. Regional Deliveries: Rural deliveries are no problem with the efficient logistics infrastructure in place throughout Australia. If you are an organised shopper and have checked the web sites Delivery timetable you can be reasonably assured that your gift will arrive on time. For those that have left things to the last minute remember Gift Vouchers and Gift Certificates are available from most online retailers and can be sent at the speed of email. You should not expect to have a gift basket delivery to Geelong or the Gold Coast on the last day before a major holiday - order early and relax. Remember you can compare prices of over 300,000 products using our search feature at the top of every ShopSafe page. You can also use it to find alternative merchants if your first choice is out of stock. If you are too late for a hamper delivery or any other purchase, you still have plenty of options. We have many sections on ShopSafe for last minute gifts. Experience gifts are one item that can be ordered as late as the morning of the 'big day' and it will be electronically delivered. You can send your loved one on almost anything from hot air ballooning to a jet fighter plane ride. Last year I was able to buy my son an advanced driving course on Christmas morning, print the emailed voucher, put it in a card and take it to lunch. (Yes, cross us off the good parenting list). Do not forget Magazine Subscriptions are always available for delivery no matter what the hour. At the top left of every ShopSafe Page you will find a magazine category link leading to almost every magazine subscription available in Australia. Again, notifications of the magazine subscription purchase can be emailed to your loved one instantly. So, it doesn't matter whether you live in Sydney, Melbourne, Brisbane or Agnes Water, you can always find a last minute gift on ShopSafe for immediate delivery to save the day. Last day for Delivery for major Holidays: We will try to update all site listings with final delivery times as merchant close-out dates come to hand. Look for the tag underneath the merchant listing. Are you looking for gift ideas for Kids, Teens, him, her, Mum, Dad, or Grandma? Is ShopSafe AU the Online Shopping Site you are looking for?